Remember to select FREE DELIVERY to reduce your costs still further. Update: Another seller, "Mlec tech", has been found selling this* cheap portable FM radio on Amazon UK and describing it as "DAB". In the detailed spec, DAB isn't mentioned. Wohnort has contacted this seller and will post any responses received here. Both this seller and the one mentioned below appear to be based in China. As Christmas approaches, it's unfortunately still best to be alert when buying DAB/DAB+ radios. Wohnort has noticed a number of "new" models that fail to mention DAB+ in their descriptions. Remember Wohnort's Rule: If it doesn't say DAB+ on the box, it probably doesn't receive DAB+. More worryingly, a portable FM radio L-938, described as "Mini Pocket Digital FM Radio DAB"* is being offered by "Househome" on Amazon UK for GBP 8.79, but with no mention of DAB in the specification. Wohnort has contacted the seller for clarification and will post their answer here. Caveat emptor! For a limited period, PURE is offering free upgrades to UK customers, unlocking DAB+ reception on compatible radios. 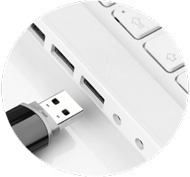 A computer with a USB port will be required to perform the upgrade. Check compatability on the PURE website. 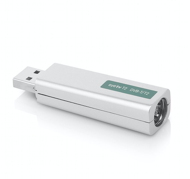 The latest release of Geniatech's eyeTV 3 software reduces the minimum system requirement necessary for H.265 (HEVC) on the new eyeTV T2 and eyeTV Hybrid USB sticks. eyeTV 3.6.9 HEVC (Version 7512) now requires Intel Core i5 running at at least 2.5 Ghz and a minimum of 4GB available RAM, compared with 3.5 GHz and 8Gb RAM in the previous build (7511). Both sticks are now available on both the UK and German versions of Amazon and both sticks would already receive the UK version of DVB-T2 under the previous release. HD in the UK uses the video codec H.264. In Germany, H.265 (HEVC) will be used, for which the stick has been, in the words of the manufacturer, "prepared". Wohnort notes that this latest release brings HEVC reception within the capability of the roving Wohnort MacBook Pro and stick. In the UK, the last remaining bastion of died-in-the-wool, "original-flavour"-only DAB receivers is the range of own-brand radios sold by the major supermarket chains. Which brand will be last to switch? With the new UK digital radio tick mark now specifying DAB+ capability (among other welcome things) to qualify, it can't be long now. With DAB+ services already on air across the UK, and more certain to follow, Wohnort recommends that the own-brand ranges be avoided until they include DAB+. In Germany, the media regulator in Bayern has granted the temporary use of capacity on the Block 8B regional ensemble Allgäu to the service * RADIO SMU *. The addition of the service is expected to coincide with the activation of a new transmitter at Markt Wald in May. This will enable better coverage in Radio Schwabmünchen's home town. The same site will also be used from next year for a new transmitter for the Block 9C local ensemble Augsburg, on which the service is already broadcast. At that point the capacity on Block 8B will lapse. A headline version of the most recent news suitable for handheld devices. Snapshot updated of the Swiss ensemble for Chur and Sargans, DIG D04 - CS. MAXXIMA and toxic.fm have lower bitrates than in the previous observation. Snapshot added of the Strasbourg ensemble SXBLOCAL+. Snapshot updated of the Swiss ensemble DIG D04 - BO, relabelled in a subtle but important way since the previous observation. Sunradio - BiM replaces IP music. Some of the other services have switched to lower bitrates. Snapshot updated of the French ensemble STRASBOURG+ (relabelled since the previous observation). AFRICA N°1 relabelled AFRICA RADIO. Snapshot updated of the French ensemble ALSACE+ (relabelled since the previous observation). Addition of Skyrock. The short trial in Belarus has begun. DAB+ Minsk is broadcasting on Block 5B and has sixteen services on board. Snapshot updated of the Swiss ensemble DIG F03 NY, relabelled since the previous observation. Multiple other changes. RNT PARIS 3 snapshot updated. Fewer services on the ensemble compared with the previous observation. Glasgow snapshot updated. Country Hits replaces KISS FRESH. Snapshots of the Belgian regional ensembles BXL-BW 2, LIEGE 2 and NAM-LUX 2 updated. A packet data service has popped up on the Danish ensembles DAB2 OE and DAB2 N. DR Logoer is running at 16 kbit/s. On DAB2 N, all P4 versions are now running at 80 kbit/s. Snapshots updated. Snapshot of the German ensemble Radio Bremen updated. NDR Info has been relabelled NDR Info HB. In Germany, the small-scale DAB ensemble in Bretzenheim, Rheinland-Pfalz, is reported to have resumed broadcasting on Block 12A. Four audio services are reported to be onboard currently. On the Drenthe instance of the Netherlands ensemble MTVNL, the service De Vrije Radio is reported to have ceased. When the ensemble was last observed in January, this was one of only two audio services running. In Belarus, Radio Radius FM has announced that the short DAB+ trial will take place in Minsk from April 8th to 19th. In addition, the telecommunications, bank and office technologies trade fair "Tibo" will demonstrate the DAB+ standard from April 9th to 12th. On the local ensembles Birmingham, Lancashire, Leeds, Liverpool and Manchester, the SIds of the new service Country Hits have changed and now match the London 1 instance. Instances on other ensembles are likely to have changed also. On London 2, the service Panda Radio has been relabelled SPECTRUM RADIO. In Switzerland, the service RADIO 74 GE+ on DIG F03 - GE has been relabelled Lifestyle 74. It is likely that the instances in Vaud, Bas Valais and Zürich have been relabelled also. In France, where the service is broadcast on FM, the regulator authorised the name change this week. The name Radio 74 disappears after 37 years on the French and Swiss airwaves. The station began in Saint-Julien-en-Genevois in early 1982 in the Haute-Savoie, but unashamedly serving the English-speaking international community in Geneva. The number 74 signifies, among other things, the number of the Département. In Germany, the public-service broadcaster Hessischer Rundfunk has brought into service a new transmitter on Block 7B. Gelnhausen improves coverage of hr Radio in the Region Kinzigtal, in particular along the Autobahn A66 from Hanau to Schlüchtern. A further transmitter at Gießen-Dünsberg is planned for the second quarter of 2019. On the local ensemble Somerset, 100% Dragon Hits and 100% Whatever are reported to have ceased. A packet data service has popped up on Trial Portsmouth. Solent Wireless is running at 8 kbit/s. In the Netherlands, the Secretary of State for Economic Affairs and Climate has reported to Parliament on the deliberations of a task force created to ensure the best use of spectrum for digital radio. Following the task force's deliberations, the MTVNL layer and the regional layer are expected to swap frequencies. As a result, a new national layer can be created for national commercial broadcasting. The resulting new regional layer will comprise smaller areas and be better suited to the business models of non-national commercial broadcasters reliant on local advertising. The new areas will also correspond more closely to the provincial borders, to the benefit of the regional public-service broadcasters. Spectrum for local broadcasting is to be released prior to final international co-ordination on the understanding that some allocations may need to change upon completion of the co-ordination process. According to the report, the local sector has been informed and accepted this proviso. Snapshots updated of the German ensembles NDR MV, NDR NDS and NDR SH. Some services relabelled since previous observation. Snapshot of the German ensemble S-ANHALT updated. The separated regional versions of radio SAW were running at 72 kbit/s when observed. On the Swedish ensembles SR DAB and TERACOM Test, the TPEG services are running with changed SIds. The changes have the appearance of typo corrections. On #EuroDab Italia, the DAB+ service RVaticana Ita + has dropped to 32 kbit/s and is now in mono. In France, the regulator has taken notice of the government's request to prioritise access for the services of the public-service broadcaster Radio France. Accordingly, the regulator has issued amendments for regional and local ensembles across France, including those already broadcasting in Paris, Marseille and Nice. These amendments concern primarily the various local versions of France Bleu and the external service RFI. No timetable is mentioned for the appearance of those services on ensembles that are already in operation. In France, the regulator has revoked the authorisations granted to a number of broadcasters who had been awarded capacity on new ensembles in Nord-Pas-de-Calais but who have failed to use that capacity. The decisions refer to Néo (Lille-Local), RBM Radio (BLAD) and Radio Scarpe Sensée (BLAD). In Germany, the ensemble HESSEN SÜD has migrated as planned from Block 11C to 12C. Snapshots of the Czech ensembles CRo DAB+ and TELEKO DAB updated. Multiple changes since previous observations. Two broadcasters, Holland FM and Radio Primavera, have announced on their websites that they are broadcasting in Gran Canaria using DAB+. According to their web pages, a pilot project is taking place on Block 7B and is receivable mainly in Maspalomas. Six audio services are being carried. A new service has popped up on the Swiss ensemble DIG I02 in Ticino. CENTRAL is broadcasting in DAB+ at 72 kbit/s. Snapshot updated. On N. Ireland, Greatest Hits replaces KISS FRESH. In Germany, a new DAB+ transmission site has been brought into service with transmitters operating on Blocks 10B and 11D. Ludwigsstadt-Ebersdorf improves coverage of the ensembles Bayern and Oberfranken in and around Ludwigsstadt. Birmingham, Humberside, Lancashire, Leeds, Liverpool, London 1, Manchester and Sheffield snapshots updated. Country Hits replaces KISS FRESH. Similar changes are expected to have taken place in Edinburgh, Glasgow, Tayside, Teesside and Tyne & Wear. Country Hits is anticipated in Ayr also. On London 1, Magic Soul has dropped to 64 kbit/s, Mono LSF. Snapshot added of the new Australian commercial ensemble for Hobart. Six DAB+ audio services are being transmitted at 48 kbit/s each. Stories prior to this date are now stored on the DAB Archives pages.